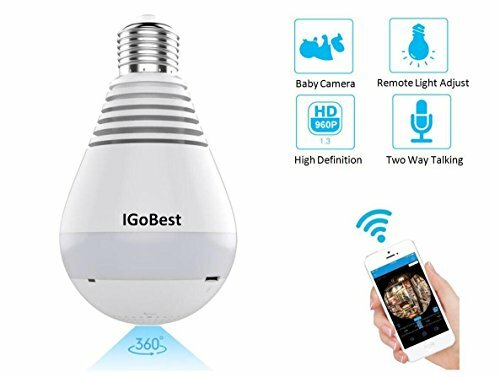 IGoBest network panoramic camera,aiming toprovide better devices with better image quality,more invisibility and betterrecording function,etc. ●MOTION DETECTION & WIFI/IP CAMERA: The alert will be launched to your mobile if any motion is detected,which make your place more safe. You can use smartphone, pad or PC to be the monitoring devices by app. It can be used in warehouse, home, office or other place. ●THE PACKAGE INCLUDE Fisheye Panoramic Camera Bulb,A E27 extension and a Manual, If any request, welcome to contact with igobest888@163.com freely, we will support you timely satisfied service. If you have any questions about this product by IGoBest, contact us by completing and submitting the form below. If you are looking for a specif part number, please include it with your message.